People who stay in the 2nd or 3rd floor rental condos get to walk down the stairs of the main entrance and around half the building to get to the beach. But YOU, future guest, only need to open the gates and walk down the steps! When you look to at the map of St. Croix below, you'll notice that the condo is near the airport, very close to Christiansted...and IT'S RIGHT ON THE WATER! Welcome to our St. Croix US Virgin Island website! We are proud to have a two-bedroom, two-bathroom, beachfront condo rental at the Sugar Beach Resort, which will give you a vacation you will never forget! We have been vacationing on St. Croix for over 40 years. We have a great feel for the island and can offer advice (or assistance) on what to do in St. Croix US Virgin Islands. 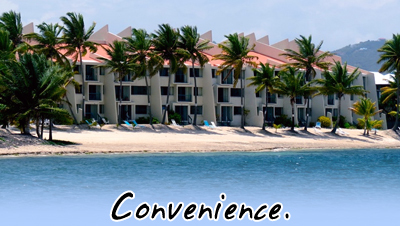 Call us for special owner discounts...We guarantee you'll love our condo & St. Croix. United States & British Virgin Islands!